On the far right, there's Paul with his eyepatch. To see about the 2006 events, where you can visit the ships (if you're going to be in the UK) click on Upcoming Events. They have a mini media file, called Dave that can be viewed. Click around the site to find it. The file is 6:38 minutes so it takes a while to buffer. Mine's still downloading. IMHO the man in the photo isn't skinny enough to be Paul and doesn't resemble him. I think this is a case of mistaken identity with Joe masquerading as Paul. The little mini media film is about the work being done with kids and folks aboard these vessels. The trust made it possible to refit the ships, and bring the kids aboard so they could paricipate in a working crew. They do a good deal of the jobs that are necessary in sailing a wooden vessel. 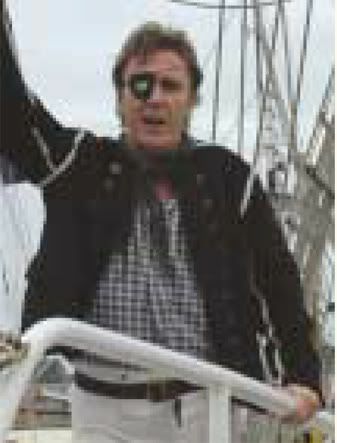 The young man, Dave, in the film, was brought high up in the rigging and that was very cool. Those sailing ships are amazing and beautiful.